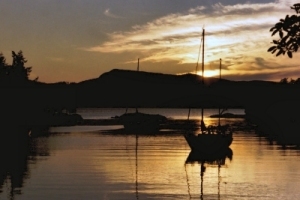 The southern Gulf Islands in British Columbia are one of the world’s most popular and scenic cruising grounds. Over 40 islands within a 40-mile stretch of sheltered water provide a variety of destinations. Each quaint seaside town has a unique flavour with attractions ranging from 2000-year-old rock carvings to an upscale resort-marina with a swimming pool and hot tub for visiting boaters. Although most of the shoreline is rocky, some classic sandy beaches are scattered about. The question for boaters in search of great beaches: where are they? To find the location of sandy beaches, I contacted a few Port Captains from the Canadian Power & Sail Squadrons who voluntarily provide information for visiting boaters. 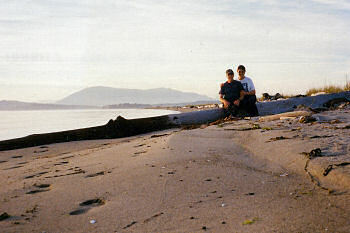 In addition to a dozen beaches in the southern Gulf Islands, they all mentioned Tribune Bay Beach on Hornby Island in the northern Gulf Islands as a great CO (clothing optional) beach; unfortunately, its location 40 miles from our cruising area prevented us from visiting on a one-week charter. I made a note that more research is needed! We arrived mid-September at Cooper Boating’s new base in Sidney on Vancouver Island. Dawn, the base manager, oriented us to our well-appointed Hunter 38 and then showed us the splendid Miraloma Hotel where Cooper customers receive discounted rates should they choose to stay there before or after a charter. Although tempting, we were anxious to get going as soon as we picked up some groceries. JAMES ISLAND The first beach on our list is located on the west side of James Island just a few miles south of the marina. Unfortunately, we couldn’t get our Danforth set because of seaweed, so we went around to the east side and anchored near a private dock. A 300-metre spit of soft sand backs onto a lagoon and private property. A weedy bottom and lack of seclusion (a tractor cutting grass nearby) contributed to a 14 rating – a beach we would not recommend. SIDNEY SPIT MARINE PARK Two miles north, we picked up one of 35 mooring buoys at Sidney Spit Marine Park on Sidney Island. All three Port Captains suggested we check out this site. Two separate beaches provide over a mile of fine sand to low water level with picnic tables, toilets, sunsets, and barefoot beach-combing. Although undeveloped, their popularity and accessibility by passenger ferry lowers their seclusion and ambiance ratings, resulting in overall ratings of 22. These certainly are two of the great beaches in the Gulf Islands, although not the best in our estimation. MONTAGUE HARBOUR The next day, Saturday, is market day in the bustling town of Ganges on Saltspring Island. Many of the local farmers, artists and artisans proudly display their wares in Centennial Park. Following our shopping spree, we departed for our evening anchorage in Glenthorne Passage on adjacent Prevost Island. By anchoring between Secret Island and Glenthorne Point, we were able to observe a beautiful sunset through our private window overlooking Captain Passage. A brisk wind the next morning carried us to Montague Harbour on Galiano Island, where we tied to the marine-park dock while checking out a north-facing beach. The view up Trincomali Channel is breathtaking but the white beach is composed entirely of broken shells — hard on the tootsies. Since sand is our personal prerequisite for a great beach, we did not rate this one although on most other factors it would score high. CLAM BAY After lunch, we continued our run north to Clam Bay which borders both Kuper and Thetis Islands. The 400-metre sand and pebble beach on Penelakut Spit, with derelict boats and debris strewn about, was disappointing. Kuper Island is private above the high-water line, although we were told by a Port Captain that visitors are welcome. Our rating of 15 indicates an OK beach. GABRIOLA SANDS PROVINCIAL PARK The next day, we arrived at popular Pirate’s Cove for lunch and a stroll while waiting for slack current in nearby Gabriola Passage. Within the Passage, we anchored in Degnen Bay and spent our afternoon viewing petroglyphs carved in sandstone and bedrock over 2000 years ago by First Nations people. 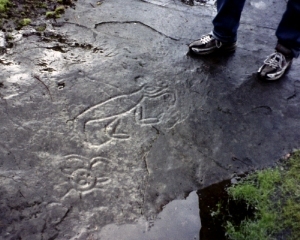 One carving at the head of the Bay depicts a killer whale. Others, about a kilometer away, show a variety of images obviously important to the early residents. We felt fortunate to be able to observe these priceless artifacts from an era before the birth of Christ. This site has the feeling of a sacred place. The next morning, we proceeded east through the remainder of the Passage, then to Gabriola Sands Provincial Park at the north end of Gabriola Island. 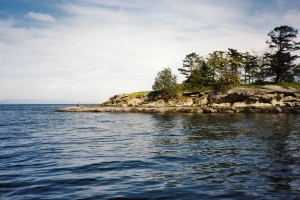 A small mushroom-shaped peninsula separates Pilot and Taylor Bays, both of which have sandy beaches. We anchored in Pilot Bay among the many private buoys and separately rated each beach. They are both about 200 metres in length with houses in view outside the park boundaries, and both have access to amenities such as picnic tables and toilets. A shopping centre is only a block away. Taylor Bay, being open to the northwest, gets the setting sun. During our visit, both beaches had rows of dead seaweed and debris at various high-water marks, reducing the cleanliness and ambience ratings. Overall ratings were 19 for Pilot Bay and 20 for Taylor Bay — good beaches. Apparently, they’re quite busy during the summer months with visiting boaters. DIONISIO POINT MARINE PARK After a stop in Nanaimo where we visited Newcastle Island and spent some time at the Dingy Dock Bar, we transited Dodd Narrows on our way south to explore a beach near Yellow Point on Vancouver Island, recommended by a Port Captain. Not finding a sandy beach, we anchored in one of three small bays just west of Yellow Point Lodge. The beaches there are shell and gravel, so we didn’t rate them. We next visited Dionisio Point Marine Park on the east side of Porlier Pass. This 200-metre beach is secluded with clean, fine sand, comfortable wading, and great ambiance created by bleached logs, smooth slabs of rock for diving and sunbathing, and sculptured sandstone formations along both sides of the anchorage. It also has the convenience of toilets and picnic tables. The only feature missing was a sunset, so we rated it 23 — our personal choice for the best beach in these Islands. If you go, one consideration when visiting is timing your arrival and departure to coincide with slack current in Porlier Pass. Overnight anchorage is feasible in settled conditions. After our survey of Dionisio Point beach, we motored to tiny Conover Cove on Wallace Island. Although late in the day, we found a vacant spot at the end of the small dock as if it were reserved for us. One Port Captain mentioned he thought there was a beach at Chivers Point on the north tip of Wallace Island. After an invigorating two-hour walk early next morning, we couldn’t find a beach – – at least not a sandy one. WALKER HOOK Anchoring the next morning at nearby Walker Hook on Saltspring Island, we were impressed with its 300 metres of south-facing, sandy beach backing onto undeveloped private land. It’s a bit cluttered with driftwood and has no amenities so we rated it 21 — good. We were told it is a CO beach but couldn’t see any bathers to confirm — again, more research is needed! IRISH BAY We then proceeded through Navy Channel to check out a sandy beach at Irish Bay on Samuel Island. This island is privately owned and the abundance of “no trespassing” signs suggests that visitors would not be offered tea. We reached across to Port Browning on North Pender Island and anchored off Hamilton Beach, which is primarily pebbles, not warranting a rating. On our last day we returned to Sidney having visited 12 beaches and rated 8. If you’re looking for a great beach in the southern Gulf Islands, try Sidney Spit or Dionisio Point in Porlier Pass. Good beaches can be found at Pilot Bay, Taylor Bay, or Walker Hook. An OK beach is at Clam Bay. Obviously, we couldn’t visit every sandy beach in the Islands during our week and we suspect a few more great beaches are out there. If you know of one in some secret little nook, don’t tell anybody. It’s too late now, but I wish I hadn’t told you about Dionisio Point!